We are now into the third week of the Tans for Women of Colour project and this week, we will be reviewing Make Believe. 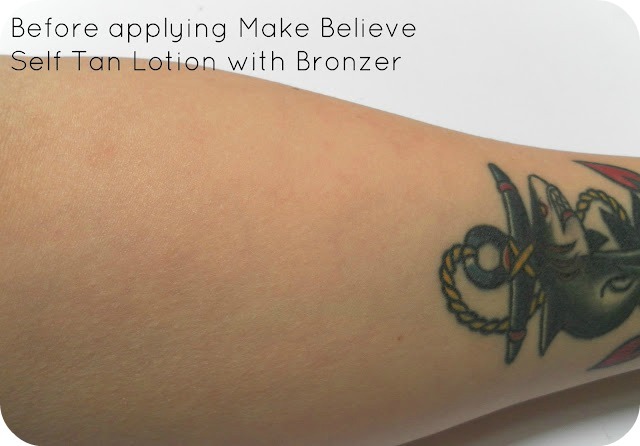 The Make Believe product I have been trying out is the Self Tan Lotion with Bronzer; Golden Tan, Zone 4. This is a one week tanning lotion. That means you apply it once (or can layer it with further applications) and it will last one week before fading. There are five colour zones for Make Believe tans. The zones range from 1 - 5, 1 being the lightest, 5 being the darkest. My partner asked me a good question the day I first tried this product out and I thought it was probably a question a few people may wonder, so I thought I would share it with you all! Well, no, they don't. The thing you need to remember when you think of tattoos is that it isn't a solid feature on top of your skin. When you get tattooed, ink is deposited below the skin which leaves the colour. So if I was to go on holiday and tan naturally, my tattoos wouldn't then just disappear under a tan - The area your skin is tattooed, is the colour of your skin in that particular area (I hope that makes sense!) And it's the same with tanning product. The only thing I have noticed, is that any white tattoo work I have, seems to appear faded when using the various tanning lotions we are testing for this project. But that is it! 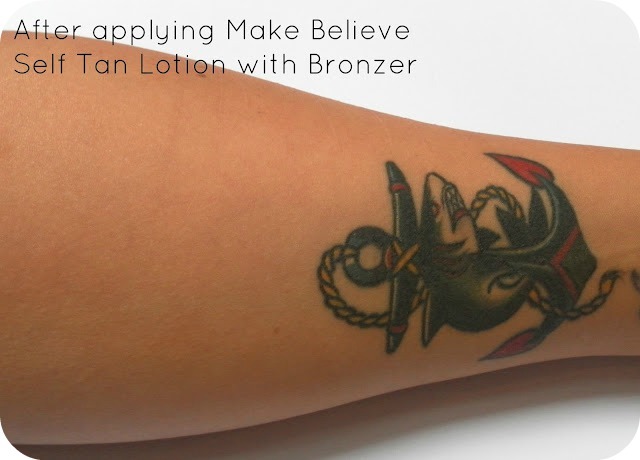 Tanning either naturally or with tanning products does not affect your tattoos! 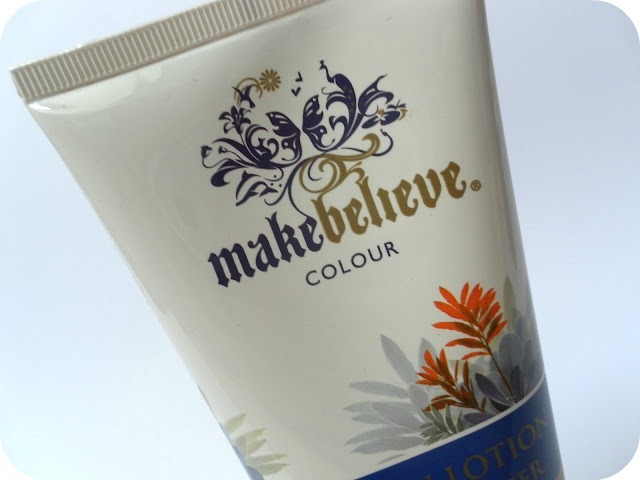 The Make Believe Self Tan Lotion boasts that it will give you a natural looking tan, whilst leaving your skin moisturised and it has an exotic fragrance. To apply you simply disperse the required amount into the palm of your hand (although I now use a tanning mitt) and evenly smooth it over your skin. This tan can be used both on your face, and body. But as you may have guessed from my previous posts on this project, I won't apply tanning products to my face. Not gonna lie, I LOVE this product. Like, really love it. It gave me a lovely golden glow all over, was easy to apply and blend it and it did last a week, only really fading the last day or so. I didn't realise notice a scent to be honest but I have had the sniffles over the past week or so which may be why. I just really love how this made my skin look and I am thrilled with the results. This is definitely a tan I would repurchase And the fact it lasts a week is great because it means the bottle (or whichever variation you buy) will last quite a while! I'm just really impressed with it and I love it! I also really adore the packaging of Make Believe. It's exotic and colourful. Just an overall lovely product that does what it says with no disappointments! I am an impressed and happy Tealady! You can find all about this product and the other products Make Believe produce on their website here. 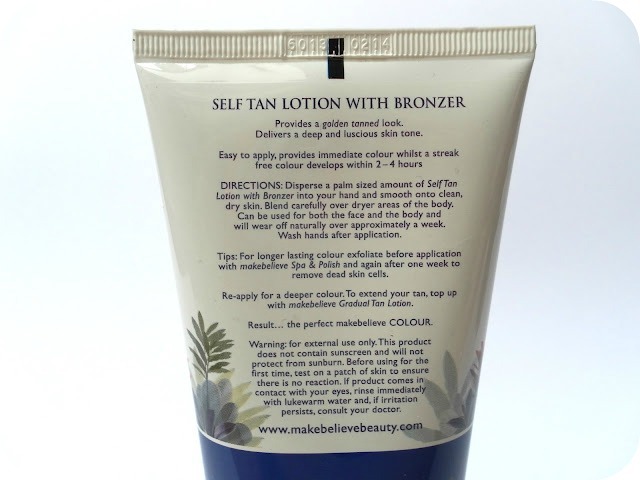 The Self Tan Lotion with Bronzer comes in a 200ml bottle and costs £24.50. This one looks really lovely! I think I like that it doesn't last too long, in case I don't like it :P hehe!